How should a blog like Reflections of a Newsosaur or a news site like SFGate prepare for tablet browsing? If tablets like the iPad are so revolutionary (as April's Wired emphatically suggests) won't there be need for considerable change to site design? Couldn't it just be that those with smart phones find the convenience of using the Web for news that much cheaper and easier as they go about their day than using traditional print? 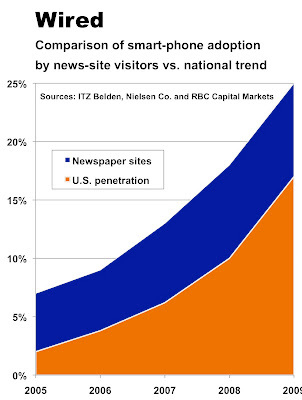 If all smart phone owners go to news web sites, wouldn't that skew the numbers? Smart phone users are growing quickly. And I'd bet most all of them are consuming news site material. Early tech adopters are probably big consumers of news. They want to be ahead of the curve. They are actively searching out information. I admire your steadfast belief that the dinosaurs in newspaper management will eventually come around and trust the Internet - something they don't understand and can't wrap their heads around, because they can't figure out how to operate without a monopoly. And I wonder on what evidence you base your belief? These are the same people who didn't see the value of content 20 years ago, who stood idly by while Craigslist, Monster.com and Google grew up and who were forced into massive layoffs because they accumulated billions in debt by buying high. "Far from being fuddy-duddy Luddites, newspaper website visitors actually appear to be early and passionate technology adopters." That is tautological: Fuddy-duddy Luddites going to stick with print. "While newspapers are struggling to stabilize their core print business at a time of contacting readership and advertising, they somehow must find the time, resources and inspiration to develop far more sophisticated next-gen digital products than they have to date." What exactly does that mean? Can you give us some examples? What, in a news context, is "sophisticated?" And "next-gen" is just a buzzword. "If newspapers fail to produce appealing cross-media content for the emerging tablet and smart-phone platforms, they will lose what’s left of their readers and advertisers to the competitors who do." Sorry, but this merely restates the problem in other words. Obviously, content needs to be "appealing." But what does "cross-media" mean? And how can it be applied to make news coverage more appealing? Luddite that I am, I think journos need to concentrate on the base of the news pyramid: Get accurate information and listen to what readers are saying. Stop condescending to them. Focusing on mythical technological fixes only distracts from that fundamental issue. News publishers know nothing about technology compared to tech professionals. But publshers do know -- or are supposed to know -- something about news. Online readers have access to a computer, an Internet connection and know how to navigate the web. I have no desire to use an iPad or interactive print media on a tablet. We are over-complicating information dissemination that can be remedied with a dedicated news staff and a daily newsletter. Interactive media is brain candy while newshounds, local and national, want easily accessible news from a reliable source. For me, and iTouch and the NYT daily newsletter does the trick. The business model exists, it is working for adopters and yet I’m stuck with a local print newspaper with an overworked staff and outsourced content and a local news homepage with worthless content – essentially aggregate referring links and blotter write-ups. The medium is stuck between a stone wall and wheel reinvention, when my fellow twenty-somethings and I feel as though our demographic information is payment enough for the content. Charge me for access to your site and I’ll find my news elsewhere, but ping me with a few offers from businesses targeting my demographic and I’ll be another click-thru/open. It’s the same reason that I’ll keep coming to this blog spot for my Newsosaur and not to Editor & Publisher. As soon as I eagerly clicked through the blog link, I was smacked with payment registration. It’s too bad, but the ‘X’ in the corner of the tab is a much easier commitment than adding credit card info. I am not suprised to hear publishers are slow to react to the smart phones, and I see that Scripps seems to be taking a new approach of separating Internet related operations from traditional print. Publishers rushed to plug into Twitter and Digg and got nothing out of it. So comes smart phones, and they decide to wait a while, especially as the IPad is about to come to market. It is a mistake. Newspapers need to be on all platforms or they will lose their audience. As for Scripps, it won't be the first mistake they have made. This was the chain that in the 1960's bet the future was in afternoon newspapers.